I'd like to introduce myself, my name is Lisa and I've been doing crafts almost all my life. I've named my *virtual store* "Baileys Victorianna" after my daughter Bailey Anna. 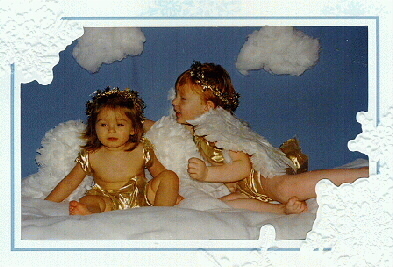 On the right you will see a picture of my two little "angels" Bailey is on the left and my son Blake is on the right. A lot of time, work and love goes into each piece I make. I use only the best products, I believe in quality and it shows in all my items. I will also make custom designs for you from any product shown, just email me your specifications and I will try produce exactly what you want. My site is new and as time goes by I will be adding more and more to my virtual store, including a lot of beautiful holiday theme items. So please bookmark this page, and come back often to see many different items made with love from Baileys Victorianna. Bailey's Victorianna has had people. Thanks for visiting!